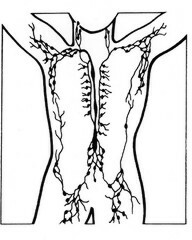 Lymphatic system (neck to upper thigh shown), which is part of the body's immune system. Hodgkin's disease is a type of lymphoma. Clusters of lymph nodes are found in the underarm, groin, neck, and abdomen.